The Rhode Island Eye Institute offers a full range of surgical and non-surgical cosmetic procedures that can dramatically improve the appearance of the eyes, forehead, face and neck. Ophthalmic plastic and reconstructive surgeons – such as our own Dr. R. Jeffrey Hofmann – are trained and certified in both eye surgery and plastic surgery making them the best qualified to perform delicate and complex procedures. “Puffiness”, “bags”, and “circles” around the eyes, drooping brows, as well as fine lines, wrinkles, jowls, scars in the skin, and many other manifestations of the aging process can now be treated often with minimal or no downtime. The latest advances in cosmetic facial procedures and skin rejuvenation make it easier than ever to maintain a healthy, youthful appearance. Some of these procedures such as Botox®, and facial fillers – including Restylane, Collagen and Juvederm – are non-invasive, requiring no downtime at all. Others, such as blepharoplasty (eyelid tuck), fat injections, or liposuction require minimal downtime. When considering cosmetic surgery, especially of the eyes and surrounding face, it is wise to consult a certified ophthalmic plastic surgeon (see www.asoprs.org), an ophthalmologist, who specializes in the sensitive tissues around the eyes. There are less than 500 of these specially trained physicians in the country. 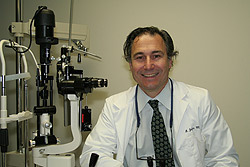 At The Rhode Island Eye Institute, R. Jeffrey Hofmann, M.D. is our expert in cosmetic treatments and surgery. Call our office in Providence at 401-272-2020, our East Providence office at 401-437-0500, or our Fall River office at 508-679-0150 to schedule an appointment with Dr. Hofmann for a consultation or to discuss any of the following procedures. Botox® – a simple in-office non-surgical procedure to smooth lines by relaxing the muscles which cause them. Facial Fillers (including Restylane and Juvederm) – non-surgical injectable products used to fill in or eliminate wrinkles and folds. Blepharoplasty (eyelid correction) – is a small-incision surgical procedure to correct excessive skin and fat pockets of the upper and lower eyelids. Eyebrow and Forehead lifts – are surgical procedures designed to reposition and contour the eyebrows and help smooth the forehead. Laser Skin Resurfacing – a procedure that uses a precise laser to smooth facial wrinkles, acne scars, and other common signs of aging and sun-damage. Fat transfer (“liposculpture” or “fat injections”) – a procedure in which fat is taken from another area of the body and carefully placed in the face to create more youthful contours. Midface lift – a procedure done with small incisions around the eyes to lift the cheek fat pads and smooth the contour of the lower eyelid and cheek.